Jungsik in Sinsa-dong, Seoul ranked 20th in S. Pellegrino Asia's 50 Best Restaurants (A50B) list, which was announced on Monday in Singapore. It is the first Korean eatery to feature on the prestigious list, reflecting the skill and creativity of founder Yim Jung-sik. "I think the world started to take an interest in my restaurant because I added Korea's unique character in my dishes, which gave me a competitive edge over others," said Yim, clearly overjoyed at the news. "I feel great that my novel take on gourmet Korean food has been recognized in this way." 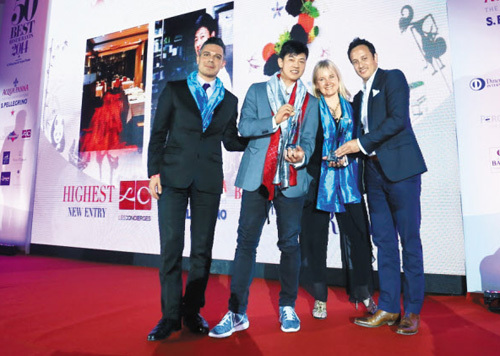 His high-class eatery also received the "Highest Entry Award" as it claimed the top spot among the newly added names. "I tried very hard to find the right matching of different dishes that we Koreans find delicious, and I think this struck a chord with customers from all over the world," he added. Jungsik has two branches, one in Seoul and another in New York. They are similar in that they both feature Yim's unique interpretation of Korean cuisine, but they serve different dishes according to the taste and preference of guests. The Manhattan branch received two Michelin stars last year. With its A50B recognition, Jungsik's status is now secure in the world of fine dining. The A50B rankings, sponsored by San Pellegrino, are compiled by votes from over 900 experts in the global dining scene, such as restaurateurs, chefs, food critics, journalists and bloggers. The list only covers restaurants in Asia. Bangkok's Nahm currently ranks No.1 followed by Narisawa in Tokyo.